We live in a very exciting time for electronic gaming, computers are regularly packing more than 4 cores, video cards have never been bigger or better, and some of the best games of last year had enough content to occupy over 300 hours of your time. Even more exciting is the power that console systems now offer, it would seem that pretty soon consoles will catch up with desktops, and all of this amazing power will be available for a fraction of the cost that it traditionally was. Game designers are working to release new titles faster and faster, while simultaneously increasing the available content, improving character dialogue, bringing actual musicians for in game music, and even consulting real military personnel and historians to make sure that every little detail is just right. Even more impressive is the rate at which games are blending online multiplayer and single player experiences. It used to be just about fragging your friends or strangers in set matches, Unreal Tournament style, now it is about building communities of people who play in similar ways, trading in game items, dropping in to games to assist each other in co-op campaigns, and of course fragging your friends and strangers Unreal Tournament style. However, for all of its polish and innovation, there are some games that I find myself thinking about from time to time, and even though Skyrim was a great experience, it has nothing on the lasting appeal of these 3 titles. 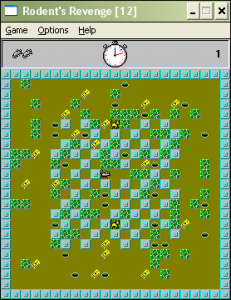 Rodent’s Revenge is a puzzle type game released in 1991, created by one man Christopher Lee Fraley and distributed in the Microsoft Entertainment Pack, it was an exciting game that had you as a mouse surrounded by deadly cats trying to push blocks to trap the cats, turning them into cheese which you can then eat for additional points. 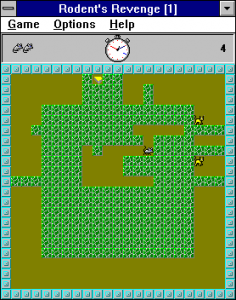 With 50 levels and only 3 lives, it displayed the kind of difficulty that many older gamers will remember was very common in the 80’s and early 90’s. I really enjoyed this game for a few reasons, which I will be kind enough to list below. 1. This game is really freaking hard. Like really dang hard. You only get 3 lives and no continues, and when a cat touches you, you are dead. Not only are there cats to look out for but there are balls of yarn that will bounce around at random and kill you, sink holes that you can fall into that will trap you until a cat comes around and eats you, and mouse traps that will, predictably, also kill you. 2. You need to be really creative in order to win. You only have on offensive weapon in the war against the cats that is pushing blocks in order to trap them. No friendly predator missiles or magic shouts, only the ability to linearly move blocks in such a fashion that you protect yourself while herding those dang cats into a single square. I feel like I should mention that at the higher levels there are immobile blocks that you cannot push, serving to disrupt your plans at the last second and getting you eaten. 3. There is no tutorial! I remember the first time I played this game I had no instructions and no idea of what to do or what was going on. There is a help file that explains the finer points of the game, but who reads those anyways? No, it was up to 5 year old me to learn how to play an excruciatingly hard puzzle game trial and error style until I earned success. That seemed to be a running theme of early games; good players were not made, but evolved by survival of the fittest until only the strong and skilled remained. The real title of this game is “Conway’s Game of Life”, but I have only ever known it as Life. This is a really interesting game that doesn’t even feel like a game at first. You have a huge 2 dimensional grid and you place squares until you are ready to start the game and you press start. After you press start your participation in the game is pretty much over, you watch your squares (which represent members of a population) live, reproduce, and die. What I love about this game now and I didn’t understand when I was young is that this game is basically math. And with these very simply rules you can create a staggering amount of combinations doing all sorts of things, like the “Glider” which reproduces itself while simultaneously traveling across the map. There are many known types of Oscillating patterns like the “Pulsar” which repeats an interesting pattern and will never fully die out. There are many subtle yet captivating elements found in this game, from a simple smattering of pixels you can create infinite combinations and patterns’, watching complex systems emerge from the chaos is simple and satisfying, and you don’t need to be a mathematical genius to appreciate the game’s simple beauty. 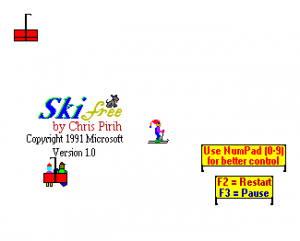 SkiFree shipped with my ve ry first desktop computer, a Packard Bell running Windows 3.1 for WorkGroups, so it will always be very dear to my heart for one simple reason. It was the first game that I was actually afraid of. SkiFree follows the trials and tribulations of an anonymous skier on his last journey down the mountain, depending on which direction you choose initially the game’s play style might be a tight series of slaloms, where you race for time, or an open expanse of mountain filled with ramps that you can hit for style points. 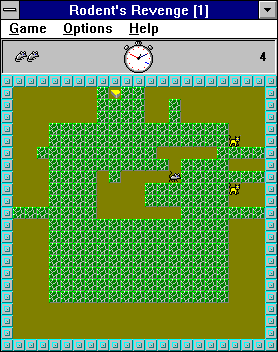 In either case, once you reach the end of the course the game gives you a score but does not stop. Why? It is never explained, but I always imagined your skiing hero had some hot babes down at the shack that he really needed to get to, so he couldn’t stop to accept his prize in the competition that he was apparently a part of. However you will never make it to the bottom of the hill, there will never be any hot babes. There will be however, an abominable snowman. Once you cross a certain distance after the finish line the snow monsters will emerge and will chase you relentlessly, if you hit a tree, fall down, or do anything other than ski as fast as your tiny pixel skis will take you, you will be caught by the snow monster and he will eat you. After the feast he will pick his teeth with one of your bones and jump up and down on the screen in such a way as to mock you for even trying. I hated that monster but I loved the game. All of these titles have a place in my heart and even though my current PC is four hundred quadrillion times better than the machines they were designed for I continue to play them. I appreciate their charm even though they do not have 32 Bit True Color, or any Anti-Aliasing options, no multiplayer, and no plot or “end” in the traditional sense. I made up that back story about the skier, the game itself never gives you even the slightest hint for why there is snow monster on the mountain or why you are skiing, but I think that makes it even more fun. These are games that never took themselves too seriously and got right to the point, they were about having fun and occupying your time. More so than anything these games are truly unique, which is why decades later they are still considered fun enough to write about.